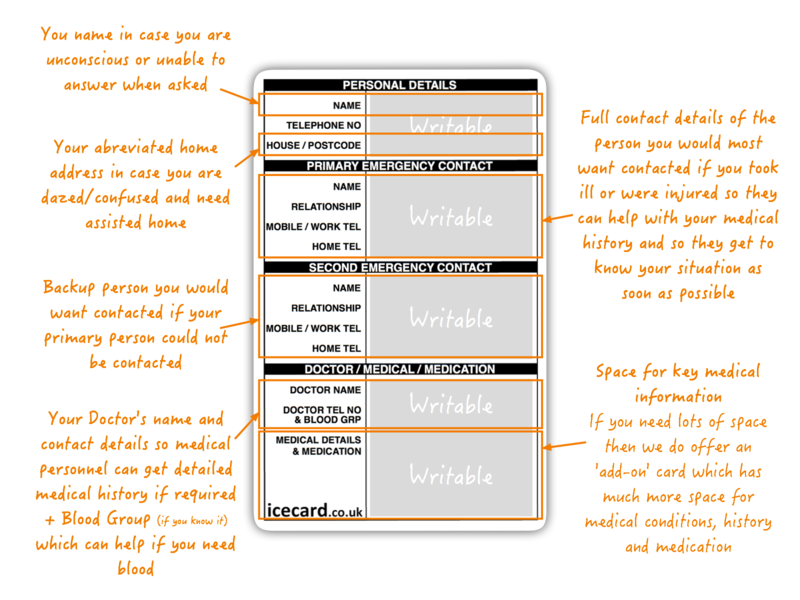 Our ICEcards have a fully writable reverse allows details to be filled in on who should be contacted in the event of an accident or incident. It gives first responders key information on critical health issues; such as medication use, allergies or pre-existing conditions. It is easily identifiable and instantly to hand unlike carrying your details in a mobile phone, which may be locked or difficult to operate. Information saves time, information saves lives. If you are taken ill or injured, carrying your ICE Card could make all the difference. Cards supplied in packs which include key rings and stickers for e.g. your phone case. Our ICEcards are for everyone - Carrying emergency contact details means that your loved ones get informed quickly if there is any emergency and they can help provide medical background and authorise procedures if they are required. • Children with Medical Conditions. Autism, ADHD, Aspergers..
• Specific Medical Conditions. Diabetes, epilepsy, etc. "I never let my son leave the house without his ICE Card. He likes to carry it because of the cool design. I like it, because it gives me peace of mind when I am not there to watch over him." "My mother passed away a couple of years ago, and my father now stays on his own. He is a diabetic, and I worry about him taking proper care of himself. I bought him an ICE Card so I could be confident that his important medical details are always with him and that I will be notified if he has a medical emergency." YOU write the details YOU want on the reverse using a ball-point pen. At NO point do you need to give us sensitive information.